here is only one primary, universal force, called by many names but has no name. It is without description or form, without beginning or end. Yet all things are created out of this power-dynamo which sustains life in the universe. The unceasing breathing, a torrential ebb and flow of atomic energy. A brilliant glare from the Center. Each one of us is a part, a particle, a participant of this All-Being. "Om" is the steady rhythm of Love. OM is the ancient hum, an audible Sound Current flowing from the Center. 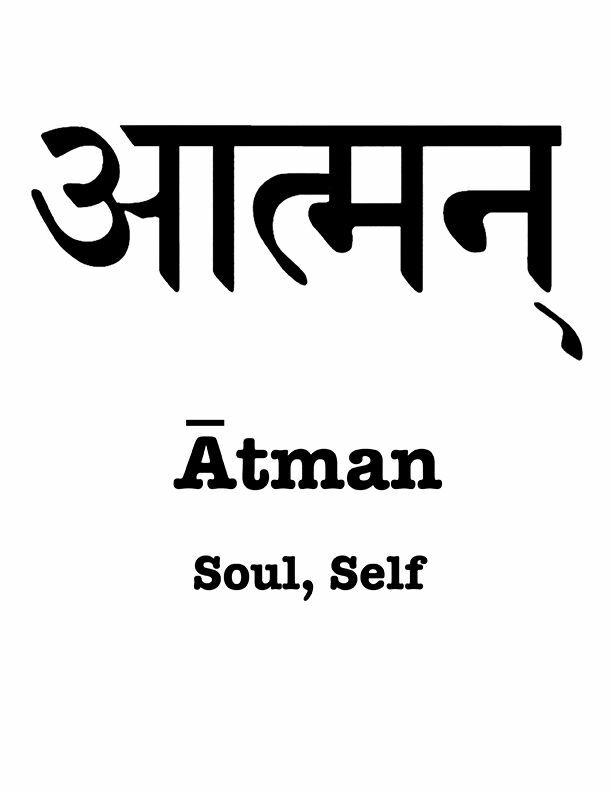 This monosyllable expresses the basic phoneme of universal thought in its irreducible state: The I AM of Creation, Amen! So it be. This haunting, poetic story is about the spiritual journey of a young, disaffected Brahman. Siddhartha left his home in a quest for answers and to seek enlightenment. After years of walking, a life of rich experiences, even meeting the Buddha himself, it still was not enough. He had grown old. Siddhartha had given up ever knowing what it was he was missing. But he finally learned the very thing he was searching for was already within him. Sitting under a tree by the Ganges River, he prepared to take own his life when he heard something... OM. Like a loving Father, God placed within us this Word, so we would never be lost. No matter how far we wandered away we could always find our way back. If we learn how to listen, a message can come from anyone in any form. The Arc of Descent and Ascent. Buddha concluded that desire is the cause of unhappiness. Not getting what you want, getting what you don’t want, even getting what you want is never enough because it just doesn't satisfy and only decays with time. Our senses are captivated by all the beauty, convinced of its reality, beguiled by the romantic fantasy of the world. It is only theater! Attachment to external reality is suffering, so it is through experience we learn how to free ourselves from illusion. Our dreams slip through our fingers until holding on becomes impossible. We must let go. Exhausted from effort, bored with amusements, riches and playing the game, Siddhartha's crises point came when something penetrated the stubborn veil of illusion: A distant cosmic signal stopped him in his tracks. He gave in. Siddhartha awakens. 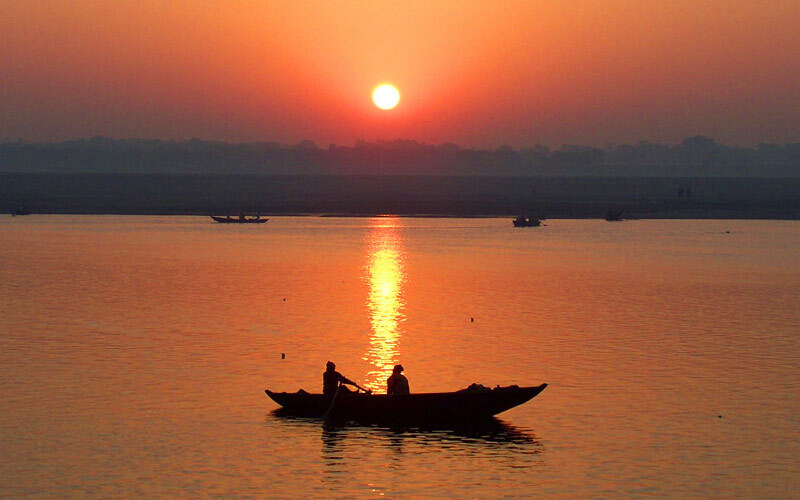 He remembers an old ferryman from his past, one who takes passengers across the Ganges. He finds him and asks if he can learn to be a ferryman too. This is the role of the Bodhisattva, one who reaches the opposite shore and turns about, back to pick up passengers. Bodhisattva. The Buddhist vow to attain enlightenment for the sake of all sentient beings. An obligation to help the rest of humanity out of compassion, because we are all connected as One. The Bodhisattva has completed much of the journey, but still remains in this physical world. The Story of the Prodigal Son: A young man asks for his inheritance, then departs his father's house to seek his fortune, to experience the world for himself. He quickly squanders his supply and is homeless and hungry, wretched and stuck. Then came an idea! To return to his father's house. To crawl the whole way on his knees if had to. To beg his father for a job. Holding on to that one thought, he made his way home to his father, who with open arms rejoiced at the return of his lost son. The allegory is about the soul's long migration home. Our peculiar predicament: Trapped like a fly to flypaper, stuck! The attention is riveted to this physical plane. The father's house is light years away, but as close as the next breath. The young man's intense desire for home was the only vehicle needed to get there. Let's say at 12:00, we left our father's house to seek our fortune. We've been gone six hours reaching the low, 6 o'clock point. We haven't found the one thing that really matters, not until we are exhausted and run out of ideas. Like children, we have been playing the game for so long we forgot it was getting late and time to go home. Why bother going? Because you can't not go! We left our home by involving matter, descending into lower thought realms until we reached the bottom of our clock model, the 6:00 point. Our thinking solidified into coagulated substance, or Karma: Including life-patterns, addictions, dark complexes and fears. Matter is so vivid! We are simply enthralled by our own world unaware it isn't real, gripped in the illusion. When the soul is awakened it can then ascend, back up the left side of our clock dial, completing its long evolution returning to the high 12:00 point of origin: Our true Home. 6:00 is that low, Siddhartha moment when we hear the OM- time to come home! It might take a jolt, some hard-luck, even a tragedy to get our attention: Perhaps the loss of a loved one, or maybe we become ill, impoverished, stripped of everything. We just don't understand, why me? It is all designed to wake us up. 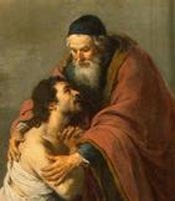 The Prodigal is the unconscious soul returning to consciousness. He lost his way and departed into a far country. Off-course, wandering, searching for the very thing he left behind! Desire must first be satiated. When the soul is finished with form, it then uses the lessons learned to be a co-worker with God. Now that's really something! But it's far from over, the round trip continues on until the soul is safely guided back upstream through more stages of spiritual maturity, until it reaches the place of Identity with God. The blinding Light of Mind radiates from the very Center: Boundless, infinite, reaching the nucleus of every atom. This is the Big Generator giving forth its humming sound. A Power Station without interruption or pause. No start or finish. It is writing itself, here is the idea for the universe happening. There are no mistakes, miracles or accidents with Cosmic Mind; Creation is never static, limited or flawed but continues upgrading. This current is centrifugal and centripetal, flowing outward from the Center of all Being and back again. Positive and negative, it breathes, just as we do, the pulse of creation. The waves roll out and the waves roll in. The Masters say without the Sound Current, there is no other way of transport back to the Father's House. It surrounds us everywhere. The fountain of energy rushing from the headwaters of God-Consciousness into the universe, sustaining it by Intelligence. This music is palpable. It's the sound on the radio, your favorite tune, it's in the blowing of the wind, in the sound of thunder and rain. A symphony of communication. This is the priceless gift of awareness, which cannot be possessed, exploited or manipulated.